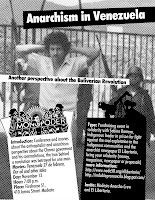 Talk and movie about the anticapitalist and anarchism perspective on the Chavez government and his contradictions, the truth behind a revolution was betrayed for one man. November 13 Hour: 7:00 p.m. Hosted by Modesto Anarcho Crew and El Libertario. Conference and movies about the anticapitalist and anarchism perspective about the Chavez government and his contradictions, the true behind a revolution was betrayed for one man.